We have been waiting for this. Our students love the Ardublock environment. They did Blinking LED and followed along withe the instructions in the book. Although the program was somewhat by not using the const int LED=13 line, they were able to still understand what was going on. 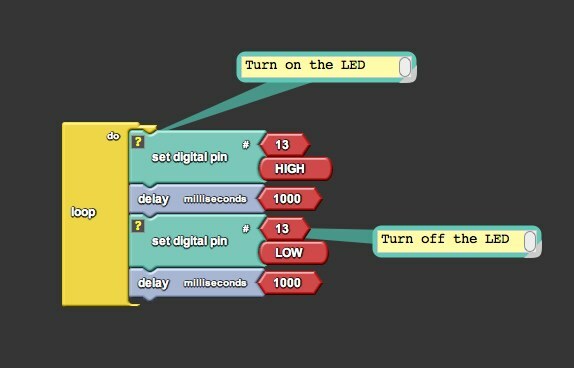 We also went over what was happening in the sketch to see what the Arduino IDE was doing in the sketch after we loaded it. Our students have used scratch alot in the past so the concept of using blocks was very easy to understand. They were able to experiment with the numbers to get different outputs. It took a moment to figure out how to delete a block but it was easily understood. Deleting something without dragging it would be a good feature. What a great GUI for our students to use and we can’t wait for more!! Thanks. Saw the photos on Facebook! It’s exciting!